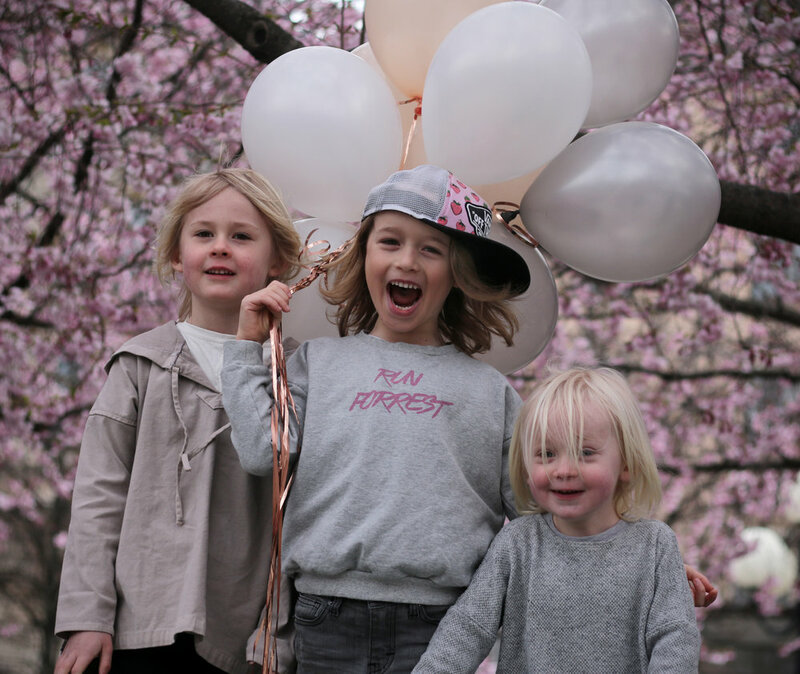 Like this set of photos for example; the kid and @according_to_e's beautiful bunch, in the middle of the blooming cherry trees in Kungsträdgården. 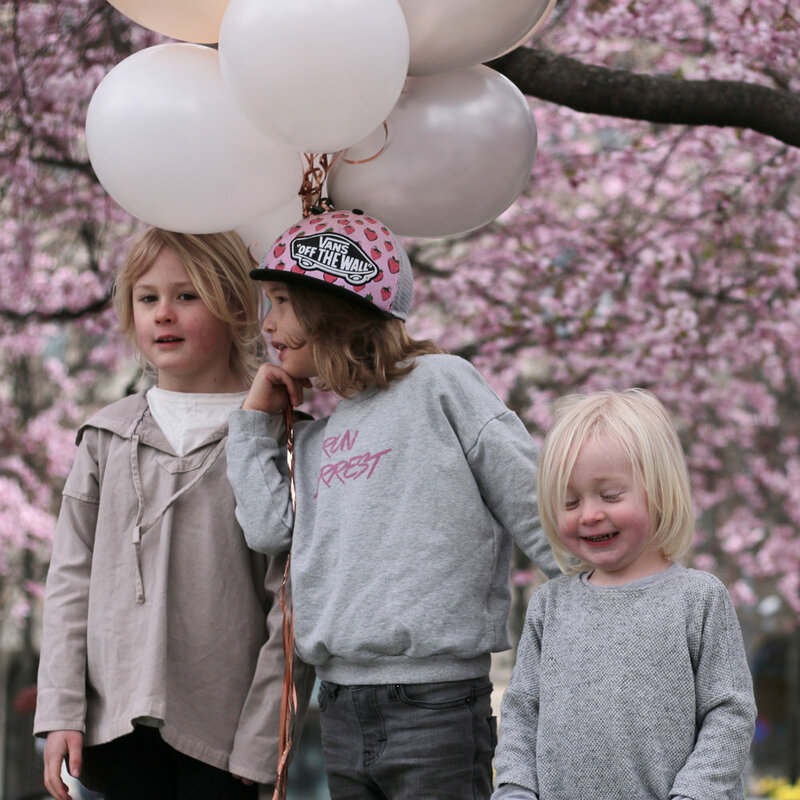 Their grey outfits such a great combination with the pink blossoms and Disas left over birthday balloons. Their faces excited for spring and summer (or for the donuts we promised that they would get afterwards). I love this crazy brood of kids. And for the first I really don't find photos of Cherry Blossoms cliche at all. But as you can clearly see in the last photo: it wasn't easy to get that money-shot, free of a million colorful tourists, and with four kids actually facing towards the camera. Or better known as; "When Spring Collections Are Dropping And You're Still In Love With The Winter-Stuff"
Did you know that January usually is the harshest winter month in Sweden? Usually we have plenty of snow, cold winds and at least a temperature of -6 celsius. I say usually because this year the weather rollercoaster is ridiculous. Some days we have snowstorms and freezing temperatures and then other days, like today, it's sunny, snow free and over five degrees warm. Don't get me wrong, I love snow and all that comes with it, but fashion-wise it usually means three months of the kid wearing a snowsuit and not much variation. The best part with days like today (other than the vitamin D-boost) is the opportunity to re-use the fall wardrobe. The sneakers come out of the closet and with them, loads and loads of denim. Those of you who have followed us since the beginning already know what our go-to brand for jeans is but it is worth repeating; I Dig Denim! The spring stuff from that same favorite brand is literally just around the corner but before we present our ss17 favorites I'd love to recap the amazingness that is their fall/winter -16 collection. So many perfect items came this past fall and now a lot of them are on sale. For us Swedes (or pretty much all of us living in the northern hemisphere) this is very good news. Winter will last for several months yet before we'll get weather that will be even remotely summer-like. We are definitely still in knitted sweater mode over here and the ones from IDD this fall are just as perfect for early spring. The same goes with jeans because honestly; you can never have too many. Especially if you are an active kid that runs, climbs and grows like weeds. So heres my suggestion; after you've checked out these photos filled with I Dig Denims fall/winter goodness, make sure to go over to their website and check out their ongoing sale. There are still some great things in stock there. And sooner than you think the kid and I will be back with I Dig Denim's fantastic spring/summer line-up. Keep having a great weekend, people! It has been way too long since I updated the blog (three months to be exact) but that is what happens when you start a new job. Life has been hectic on a whole new level and the winter up here in Sweden can drain the energy out of pretty much anyone. Thankfully we were all way more energetic back in September when my fantastic photographer-friend Erica and I took our trio of rowdy boys to the park and shot these photos for you guys. I bet that you are all aware that Bobo Choses will be launching the first drop of their amazing SS17 collection in just a couple of hours and we have a happy little sneak peek right here. "A Legend" is the best collection from Bobo in a long time, if you ask me. Its playful, fun and so deliciously retro! The sports legends theme feels fresh - filled with classic sports such as swimming, tennis, badminton and cycling, just to name a few. I mean, honestly? How could I not fall in LOVE with the John McEnroe print? Mr W and his buddies Mr T and baby L set the bar high when trying out the first pieces from the collection. Climbing, jumping, shooting hoops and running laps and we can safely say that yes - these are clothes for the true legends of the playground. One thing that made me extra happy was the fact that in this collection, there are actual white pieces and details. Not "eggshell" och "light beige" but fresh and clean true whites. It goes so well with the classic Bobo Choses washed out look and gives that extra "oomph" to the retro prints. All in all, "A Legend" feels like a true Spring/Summer collection, filled with happy colors and fun design. The boys are showing off just a few of the many items and I'll be back in a couple of days with more. Until then; happy shopping people! And have a great Thursday! The boys are all wearing SS17 Bobo Choses which can easily be found at great retailers such as swedish Dellemyr or Cirkusfabriken. Polarn o. Pyret turns 40 // It's almost time for the party! 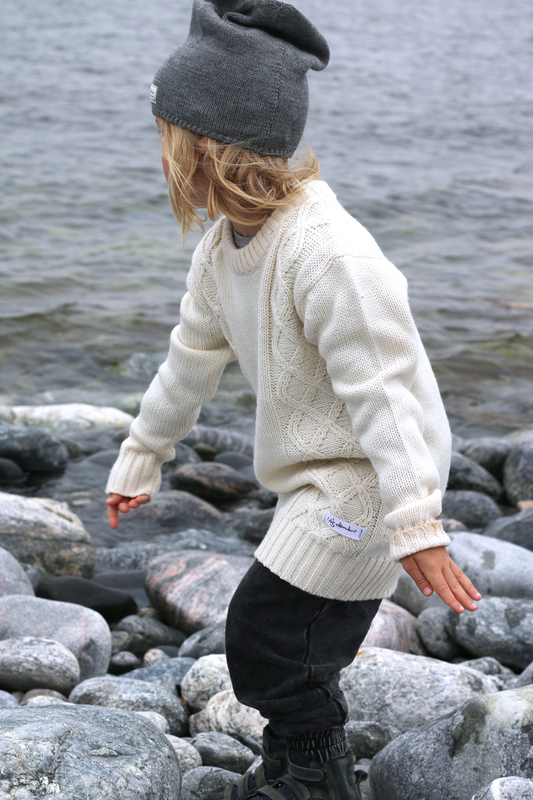 So here's a fact: Polarn o. Pyret is a Swedish brand that has been in our household from day one. Literally. The first clothes I wore bore the classic P.o.P stripes and so did my kid's first blanket. And this year, this veteran brand within kids fashion is actually turning forty (which is longer than I have walked this earth) and they are celebrating big time. On Saturday, October 29th, Polarn o. Pyret will launch their Party Collection, a wonderfully playful batch of cotton goodness. Happy colors, party feeling and the classic stripes - all combined. I mean, look at that turquoise tutu and the circus print? And the yellow pieces? They just make me so happy! The collection is not just their usual "functional and comfy for preschool". It is really cute! Polarn o. Pyret has a long history of quality and function. Comfortable cotton i basic colors and sturdy outerwear for the Swedish climate. Don't get me wrong, I love these things about P.o.P. But their fashion is also creative and childish in a fun way and the Party Collection is a great example of that. Now: here's a sneak peek of the stuff they will be launching. Enjoy! The kid, Super-Max and the ever so lovely, Miss Lily. What a bunch! Can you feel the party vibe up in here? Who doesn't want balloon print pants on a Saturday? The vertical stripes feel like a fun variety to the classic horizontal ones. The party pandas are another favorite of mine. How happy are these yellow pieces? Lily's circus print shirt and tutu? Too cute! And Super-Max? Gahh! All the hearteyes for this boy. All items that the kids are wearing are from Polarn o. Pyrets Party Collection. Launch is on Saturday, October 29th, at 10 am Swedish time. Have you heard about TheBrand? I bet you have. But have you heard about the great things that they are doing with one of our favorite shops - Babyshop.se - this month? No? Then let me tell you all about it. See, September is "Children-with-cancer-month" in Sweden and in honor of that Babyshop.se has decided to donate 10% of their sales from TheBrand during the month of September to a foundation called Barncancerfonden (The Childhood Cancer foundation). In Sweden 8 out of 10 children fighting childhood cancer survive their disease and though 80% is a really good number, it is still far from enough. We should be able to do better than that, right? The fight against cancer is a fight that all kids should win. Through this great collab you can support Barncancerfonden and shop great kids clothes at the same time. The Brand is cool, comfortable and with a great sense of streetstyle and although its not as "friendly-made" as the brands we usually promote on this blog, I feel as if this campaign; this stand against childhood cancer, is worth highlighting. Good job, Babyshop.se and The Brand! Keep doing things like this and we'll keep supporting your businesses for sure. Keep spreading the awareness under the hashtag #80procenträckerinte or #80percentisnotenough. You can also make a contribution directly to the childhood cancer foundation, Barncancerfonden. Today we went skating. Me, the kid, our skateboards and a whole skatepark full of crazy riders. Just the usual calm, lazy Sunday. But we had a great time and the weather was actually perfect for skating. Not too hot and not too cold and with just the right amount of wind. This summer Mr W mostly wanted to skate ramps because of the thrill and the lack of resistance. But after carrying two boards and helmets back and forth the park one time too many I decided that enough was enough. The kid needed to learn how transport himself (on his board), at least on the flat surfaces, so we started practicing on kicking himself forward. And today all that practice finally gave fruit. Yay! Now, how cool is the kid's new sweater from Gardner and the Gang? I love this brand, that is no secret, and Carneval Vices - their AW16 line - is just as fantastic as always. The light sweatshirt is a gorgeous blue color and thin enough to suit my active kid. I felt extra good about the Mr W wearing the shirt today because the skatepark that we frequent are doing it's absolute best to attract more girl skaters. Mr W usually skates with one of his best friends, Miss M, and when the skatepark started their project GRRRLSK8 they were both a bit confused. Why couldn't they just all skate together? Because like with most activities; it's more fun when boys and girls can play together. But we explained to them that boys were allowed in the park, we just needed more girls too, and after that we make it a point to try and mix up the group. Bring more girls to the park and to stress that skateboard is for everyone. Girl Gang or Boy Gang: We should all be one BIG gang of love, right? One day I'm going to bring the camera when we have all them little skaters at the ramp. That will be a great blogpost for you all. They are amazingly brave for a group of four and five year olds. Another thing; If you are in our part of the world and need a great board for your kid, then make sure to check out the youth boards from PROSK8. The are small enough to fit a child but it still has the quality you need in a good skateboard. PROSK8 also uses Tip Technology which makes the boards last way longer than they usually do, especially for kids. If you'd be interested in more blogposts concentrated on skateboarding and its equipment, let me know. Now I need to go read bedtime stories for my little wild child. He is extra tired after all that skating today. Good morning, everyone! How has the week been treating you so far? Us, we are still getting a hang of the daily grind after summer but I am actually feeling okay about fall. Especially when I look at all the pretty autumn pieces from Soft Gallery. I am a bit embarrased to say that I never realized before just how good Soft Gallery is as a brand. Sure, I found goodies in previous collections but I've never really seen their collections as a whole. But, man, this fall? Yup, now they have my full attention. What I love most about this danish brand is their ability to make everyday fashion stylish. Their AW16 - Home Sweet Home - is a collection meant to be worn, to be played in, and it still looks perfect. Soft items, smooth autumn colors and a collection that goes extremely well together with other brands on my favorites list. The mustard yellow for example; a color we've already seen a lot of, is a staple in Soft Gallery's fall line. And the beautiful blue tones that go so well with those earthy tones that autumn brings. Like previous years, Soft Gallery are talented when it comes to prints. The owl is a favorite and I love that fishbone print on Mr W's pants. But if I could only pick one piece from the line-up I would go with the beige rabbit sweater. It surprised me - I'm usually not a fan of beige at all - but this one really is perfect. The perfect shade of cold beige that works so well with the blue print. The wisdom of "Make your own luck" and then with that anchor on the right shoulder? It made me fall hard. From the photos below it is easy to see that the kid and his buddy Mr. T were enjoying themselves even though the weather is getting colder. It's still warm enough to go barefoot most of the time and that is usually enough to have a great time when you are four years old. To me it is always important that my kid can play freely and when a brand like Soft Gallery withstands climbing rocks, running in the woods, getting your feet wet in the pond and even some ninja moves, then I feel good about dressing my kid in it. SOFT, an ongoing part of Soft Gallery's collections, have the GOTS certificate (Global Organic Textile Standard). This applies to items with the classic Owl AOP as well as the Mini Pebbles AOP. I hope that as time passes, SoftGallery will strive to have all items in their lineup GOTS. As a company they also give a lot back to the community though which, in my book, puts them in the "friendly made" category. For example, their primary production is based in India so when selling items made in India, a percentage of the sales goes to Danish Indian Childcare, an organisation that provides a home and education for the young girls and women in India. Now keep enjoying your day folks! (and the rest of the photos, of course). We will be back with more autumn favorites in no time at all. Mr. W's beanie is from I Dig Denim and Mr. T wears a CTH Mini hat in true "Emil in Lönneberga"-style..
For outfit details and retail info, see bottom of this post. Okay, I agree. The title of this post is slightly misleading. Winter isn't coming this minute, or even any day now. But let's face it; in Sweden the seasons change really fast and it's wise to prepare early. Early bird catches the worm and all that jazz... Plus, with all the perfectness that I Dig Denim is dropping, who wouldn't want to start shopping early? Our favorite brand, all categories, has outdone itself this fall because AW16 has everything, really. I Dig Denim is hands down the best kids denim brand and this year they are bringing it, for sure. The perfect skinnies, the gorgeous knits, the warm parkas and, as always, the details. Everything is up to par with their usual greatness. In the last post about IDD’s fall collection I showed you an outfit great for autumn weather and this post is more suited for winter. Knits and layers suited for cold days and icy winds. AW16 is a pretty big collection and the combination are endless so for this one I’ve focused on one outfit, alternating two of my favorite outerwear pieces in the range. Though this season comes with a really cool black version of the Luke bomber jacket, my favorites are still Buster and Lester. Buster, the checkered lumberjacket-like shirt is new for this season and I’m telling you, the mix between a thick shirt and a thin quilted jacket is amazing. Perfect for early fall, and with a knitted sweater underneath it works well even during winter. Lester, IDD's winter parka, was available in last year’s line-up but now it comes in two new colors – black and green. The faux sheepskin lining is warm and comfortable and the hood is oversized and perfect. Now, don’t get me started on the knits. The choice of beanies is great this fall and there are several knitted sweaters that are to die for. The off-white cable knitted sweater, Frits, that the Mr W wears in the photos is perfect in both color and softness. Not at all itchy and warm enough for cold winter in the north. 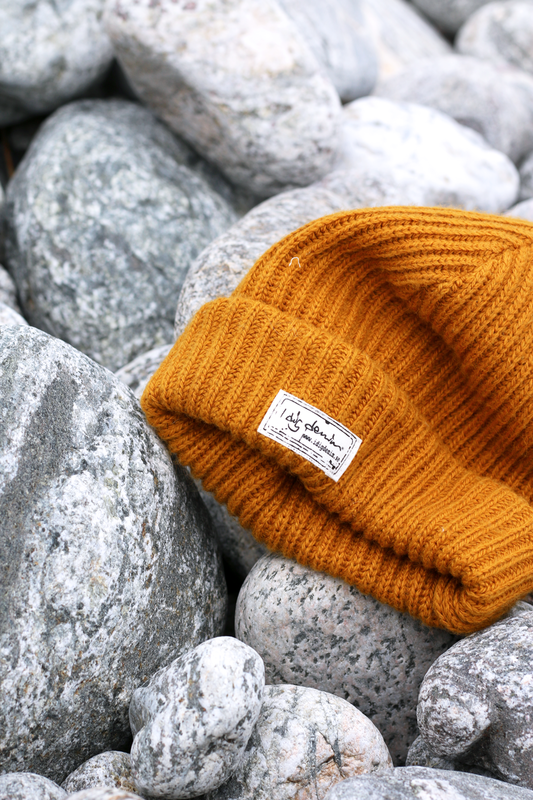 And the Zion beanie will be a big hit, for sure. Call it mustard, maize or maybe golden poppy but the rich yellow and rusty orange tones are most certainly a trend this fall. The model is perfect rolled up like a chimney hat but it also works as a looser style beanie and it brings out the grey denim tones brilliantly. Then there is the grey beanie called Wyatt (I think it is actually from I Dig Denim Woman but I could be wrong here) and it fits Mr W like a glove. One thing that hit me about this year’s AW-collection is the larger range of non-denim items. The jeans are just as gorgeous as ever, of course. Our beloved Arizonas come in a darker blue wash and the skinny, stone washed, new model Bruce is so perfect that I want them for myself. Yet what I love most is that we now have so much more from this favorite brand of ours. Like the baggy vintage-washed mix between joggers and jeans, complete with elastic waist and cuffs at the wrists. Or the charcoal version of the Drest sweatpants in this post. I could basically have Mr W wear nothing but IDD all winter and he'd be looking cool too. If you think that the parka looks huge on the kid, then it's probably because it is. Mr. W normally wears size 110/116 and the parka in the photos is size 122/128. Of course that is way too big for him and I should have realized that but maybe the winter will be super cold and I can put the thinner jacket underneath the parka. :) The parkas are a bit on the bigger side but the rest the collection seems to be equal to the past ones, which means that it is relatively true to size. Though if your kid is between sizes, I’d size up. A bit too large is always better than too small, right? In this post (shot in July) Mr W wears every item one or two sizes to big since the clothes need to fit him over winter and it's still only August. Now, for every collection, I dig denim’s aim of an all friendly-made production is set higher and higher. All of I dig denim’s products are produced under high requirements ensured by the producers and partners they collaborate with. And the brand maintains a continuous dialogue with their suppliers to ensure that they are committed to rigorous standards regarding working conditions and ethical responsibilities. The producers ensure that the production lives up to high requirements and audit that it takes place under good working conditions. You can read their Code of Conduct here. Toddlers and Tees usually carry great stock too. For outfit details, please see bottom of this post. It’s almost time for the big drum roll. Our favorite brand, all categories, is making its first drop any day now and we have been waiting not so patiently for this since spring. I know that a lot of you get all hyped up about the big brands like Bobo Choses and Mini Rodini but for me and the kid this is the most important collection of the season. And I just can’t rave enough about I Dig Denim’s AW16. It is amazing. I mean it. You have seen their denim shirt Zoe already and during summer I pulled together several photo-shoots to cover a large part of the remaining collection. But however many photos I take, I still feel as if I could show you more. AW16 is a pretty big collection and the combination of outfits are endless, it seems. So this post will be a pre-taste, so to speak. A glimpse of just how amazing this brand is by showing you an outfit that works during early- and mid autumn. And then in a couple of days I'll be back with part 2 on the Free and Wild Child Blog, which will contain the new fantastic winter parka for example and the mustard yellow beanie, Zion. For now, all the photos in this post are shot in July but humor me and pretend that it’s on a cold day of autumn instead. One with the earthy scent of autumn leaves and with winds that nip at your nose. See, I am one of those weird people that actually love the fall-season with all its knits, beanies and scarves. High summer is glorious in so many ways but when you love fashion the warm weather is kind of limiting since half the time you only wear swimwear or shorts. I have almost too many favorites and, as always, the items all work together seamlessly. Overall, I dig denim’s fall/winter range is mostly different shades of grey and black with a few accentual colors. For those of you who have been waiting for darker blue Arizonas, the wait is over. Also; make sure to look for “Bruce”, the skinny jeans. They are golden, I tell you! From what I’ve seen, the collection seems to be equal to the past ones size-wise which means that it is relatively true to size. But I always recommend to size up if you are in between sizes. Better with a little room to grow, right? I could go on and on about every piece in this fall-line but I am going to shut up and let the photos talk for themselves. Just one last thing; For every collection, I dig denim’s aim of an all friendly-made production is set higher and higher. All of I dig denim’s products are produced under high requirements ensured by the producers and partners they collaborate with. And the brand maintains a continuous dialogue with their suppliers to ensure that they are committed to rigorous standards regarding working conditions and ethical responsibilities. The producers ensure that the production lives up to high requirements and audit that it takes place under good working conditions. You can read their Code of Conduct here. I have been a big fan of this brand for a long time now and I must say that I am very proud of this progress. Go I Dig Denim! The I dig denim AW16 collection will be available at their own website and through several retailers. I Sweden, two of the retailers to count on are Babyshop.se and Magasin Kusin but you can find the entire list at www.idigdenim.se. Are you excited? One more sleep, then it is finally here - the longed for autumn/winter collection from Tiny Cottons! Set to launch on July 26th, the drop falls right in the middle of all the other brands - but boy, does it stand out. "Face Your Faces" is an amazing collection, all about emotions and their different faces. And Tiny Cottons have done a great job exploring the graphic world of feelings. The patterns and prints are playful, full of character and with that extra twist that I love from a kids fashion brand and every item is thought through and functional while keeping that stylish edge. Most important of all; it is still friendly made in organic cotton and merino wool. All items that the boys are wearing come from Tiny Cottons AW16 collection, Face Your Faces. For residents in Sweden, Babyshop will stock most of the collection and all items can be found there. For outfit details, see bottom of this post. Sunday was such a perfect day! We hung out with friends all day (friends, who we actually first got to know through Instagram but now feels like we've known forever) and we got to enjoy both warm weather, great company and lots and lots of laughter. The kid was ecstatic from the moment he woke up. He has been looking forward to another playdate with his buddy Mr. T and for weeks he has been asking to go look at the snakes at the local Zoo, so we combined the two and went to Skansen for a full day of fun. Erica, Mr. T's mom, is one utterly amazing woman. And on top of all her other great qualities she is just as kidsfashion-crazy and photography-loving as I am. It was so nice to hang out with someone who sees the bigger picture the way I do and who doesn't look at me like I am crazy when I match the kid's ID-bracelet with his trucker hat. Now, imagine my joy when we realized that the kids wore matching items from Dots & Stripes. Oh, the photo opportunities! Dots & Stripes is an amazing brand. Small, independent and friendly-made by the fantastic Karolina Strömblad. As the name implies, her collections often incorporate dots and stripes and most of the line is within the monochrome spectrum. The salopettes that the kid is wearing are my personal favorite from this summer but from what I've seen of the upcoming fall/winter line-up, Dots & Stripes will have lots of great items to choose from. In her own words Karolina describes her brand as children's clothing inspired by skate, surf and snowboarding. The clothes are unisex in classic cuts with a little twist. The fabrics used are Oeko-Tex Standard 100 and GOTS certificated and every item is sewn in Karolinas own home. Mr. W wears the dotted salopettes and a dot and stripe tee, both from this amazing Swedish brand. Mr. T wears the dotted shorts. Both models are also available with long legs and the stretchy material allows for lots of climbing and running as you can see from the photos below. The fact that my kid is a hat-lover is probably no secret. His favorite caps are the trucker model from Munsterkids and on this Sunday he actually brought two. Half the time he ran around with both and now and again one of them ended up on Mr T's head. According to the kid, wearing two equals a hat that looks like a crocodile's gap. He loves all kinds of reptiles so he was very happy about this. For all you mamas with wild kids who love to run around in crowds, I can really recommend the ID-bracelets from Road-ID. The kid has been wearing them since he was around 1,5 years old and has just recently grown out of the smallest size. (For Swedish mamas, there is a great alternative from local ICE112 but without expensive shipping and toll from the US). The bracelets can be worn 24/7, even while swimming, and I feel a little safer knowing that he wears my contact information. A fun fact about the pants from Dots & Stripes: Both kids firmly believed that they wore seal-pants. That the grey color and the dots would appeal to the nordic seals and that it was thanks to wearing them that they actually got to see the seals in the pool. Me and Mr.T's mom Erica just nodded along of course. Kids have the most awesome creative imagination. Mr. W wears a Short Dotted Romper and a Black and Striped tee from Dots & Stripes own webshop. Both trucker hats are from Munsterkids, bought at Orange Mayonaise. Vans Originals are bought from Vans Brädkultur. I am not sure what Kristin Nyström (founder of GG) and Jaime King (actress) had in mind when they called the collection Lion's Heart - I've even tried to google it - but I'm glad they did. See, not only is "The Brothers Lionheart" by Astrid Lindgren one of my favorite childhood stories. I am also a mother lion and this brave little kid of mine is truly my heart. What could ever fit him better than this tee? This evening I took my lion cub out to get some popcorn and we brought the cruiser (for him it's honestly more of a longboard). It is still too heavy for him to maneuver on his own but he likes it when I pull him along on it. We stopped at one of our favorite cafés for some coffee (for me) and we ended up sitting there for a long time. I brought up the story about the Lionheart brothers (he hasn't seen it yet since he is only four and a half) and we talked about life and death, Nangijala and brotherhood and dragons that might not be nice like Toothless. We touched on sickness and we dug deep in the love-topic. I saw more of his serious face than I usually do but I guess that those heavy topics gave my baby boy a lot on his mind. I love his smile so much but his thinking face is also a favorite. As much as he can be is a wild child, he is also a gentle soul and he thinks long and hard about thinks that he feels are important. At the end it felt like he was satisfied with our talk and we ended up getting ice cream instead of the planned popcorn. A simple skateboard ride turned into deep conversations that still, two hours later, warms my heart. A magic evening, for sure. But the way, this denim shirt is pure love! It comes from I Dig denim of course - no surprise there - and it will be available in August once their AW16 drops. It's Mothers Day in Sweden and after a gloomy and grey couple of days we finally got some sun. Thanks to that change in weather we could celebrate the day in my parents magical garden, eating ice cream and berries outside and helping the my mother with garden work. But the looming chill in the air, after four consecutive days of low temperatures, also gave us a good opportunity to use the new hooded shirt from Luvmother. Luvmother is an amazing Canadian kids brand that truly fit the "friendly made" genre. Their clothes are made out of amazingly soft merino wool and if your next thought is "Oh no, not wool! That is itchy and too hot!" then I'll stop you right there. The kid wears Luvmother's clothes without anything underneath and they do not itch one bit. On the contrary, they are light and thin and they are actually quite genius. See, when its hot outside the merino wool items keep him cool and ventilated and when there's a chill in the air they keep him warm. During Swedish winter they work perfect as a base layer under the ordinary clothes as the pull humidity from the skin in order to keep the body dry. The shirt that the kid wore today is called "Aha Merino Hoody" in the color Atlantic, but to me its a beautiful blueberry blue color. The fit is really good, not too big and not too snug (he wears a size 5-6 years) and with the hood up he actually looks like a little blueberry boy. He thinks he looks like a ninja though so I guess we're both more than pleased. “It takes a lot to make a garment. Not just the bits we hear about – the designers, the brands, the shops, the catwalk shows and the parties – but also the farmers who grow cotton, the ginners, spinners, weavers, dyers, sewers and other factory workers without whom the industry would not exist." The kid absolutely loves his grandparents and helping grandma with gardening is a favorite pastime. Today he got to help with the bushes and he was so proud. He even did a little dance to help the peas grow faster. With the hood up he kept the nippy air out and later in the day when it heated up, he pulled it off and replaced it with his trusted trucker cap. Later in the evening, after a full day of fun, swimming in the pool and picking wild flowers as a mothers day gift, he layered up. He also found a new friend. A snail that he - with logic only a four year old can understand - named "Fiskmås", which means Seagull in Swedish. Fiskmås was invited home for dinner and he carefully carried the tiny thing back to our house. Its easy to see that I had a great Mother's Day. I got to hang out with my child AND my mother and that in it self is making me feel very thankful. We also had great adventures today and it is always amazing to see the world through my kid's eyes. But what makes me most thankful is the fact that Mother's Day isn't over. To me, its mother's day every day that I get to spend with these two. Hugs all around, people! Right now me and the kid need to go let "Fiskmås" back out into the garden. For purchase details, check bottom of this post. Hi people! Sorry for the long break. We had stuff to do and then this gorgeous summer weather hit us full force and we had to take advantage because, seriously? In Sweden you never know when you'll get above 20 degrees celcius again. But here is some news from our household: The kid has suddenly turned into a Parkour enthusiast. My child – who used to be such a cautious baby – has morphed into a little daredevil whose biggest interests are climbing and jumping. Preferably with said caution thrown completely to the wind. Short distances that used to take us ten minutes now take almost an hour because every fence, large rock or passing structure needs to be conquered before we can move on. Thankfully he is not applying this new wildchild-technique on skateboarding or bicycling or my heart might not survive it. By the way; did you guys check out the collab between our friends OneWeLike and super cool AcneJr? If not, then go do that right this minute. The balloon tee that the kid is wearing is one of my absolute favorites from their collection "Prints" but there are so many more. Like the Monster sweater, for example. I adore that one. I feel like the balloon goes well with this new side of my child. He flies high and he is so full of pride when he manages a particularly high jump or complicated climb. Just recently he also started Karate class and that has done wonders with his balance and body control. And I have got to give credit to I Dig denim for making Arizona cut-offs. The shorts version of our favorite jeans model are sure to be well-worn this summer because of the comfortable fit and - who am I kidding - the amazing style. They go with everything in the kid's current closet and my only wish is that I had them in blue for him as well. And maybe in black. And in white and... yeah, you get the picture. The trucker cap is from the Australian brand Munsterkids, of course. They seriously make the best hats. Perfect fit, great quality and cool design without being "too much". I was in luck when I found old styles at a great discount over at the dutch onlineshop, Orange Mayonaise. Basically three for the price of one and I still think they have a couple in store. Some days are just more fun than others, and today was a great day! I don't know how long we have been talking about a playdate with our Instagram friends Erica and Ture (@enligt_e) and today it finally happened. The kids played so well together and it's amazing to see what two creative 4-year olds can come up with together. In the span of ruffly three hours they were doctors, truck drivers, chefs, ninjas, sailors and played about a hundred rounds of hide and seek. They also manage to pull together three minor injuries and one puddle accident between the two of them and got muddy beyond belief. The was one disagreement - which was quickly solved with a cinnamon roll - and loads of laughter. The silver lining? Erica is an amazing woman and I am pretty sure that I had just as much fun as the kid had with his new friend, Ture. It was not the last time we pulled together a playdate, that's for sure. Oh, and outfit details is a haphazard bunch of brands. See bottom of this post for details. This Friday started off better than usual with a fun event at kidsfashion store; Babyshop. Our favorite brand I Dig Denim hosted a breakfast there and the ever so wonderful Hanna Clavegård - founder of the brand - talked about the their spring/summer collection, the upcoming fall and sustainability. The atmosphere was relaxed and fun and Hanna spoke passionately about her journey with I Dig Denim and the future of the brand. Best news today was the confirmation that I Dig Denim will be dialing it up several notches in the ecological department. Way to go I Dig Denim and way to go Hanna! I found Johannes Maxweller, who runs Pappabloggen, and his gorgeous son Flynn at the event and let me tell you; young Flynn was the true star of the day. What a cutie. In honor of the day he was decked out head to toe in I Dig Denim's baby collection, charming everyone around him. The youngest guest at the event, going through the flyers like a real pro. Such a great morning full of gorgeous denim and wonderful people. A big thanks to Babyshop and Mildh Press for hosting and, Hanna and Hanna; soo so good to see you both! Easter celebration is in full force at our house. And according to Swedish tradition we dressed the kids as easter witches and went out to collect candy in the neighborhood. The kid had painted his own Easter cards to hand out and was more than a little excited about the whole concept. As most four year-olds he loves to dress up and he even sat for some face paint, but when it came to picking out his outfit he was adamant. It was all about the prints. Go bold or go home, no? Easter is all about Spring and what could fit Spring better than green and yellow. The clover print from Mini Rodini was perfect and when surprisingly well with the yellow snakes from an earlier collection. To top it off, the kid picked out a bowler hat and an old cane left behind by his great grandfather. He scored a lot of candy but in the end he was most excited about handing out his art. It was a great afternoon, a perfect way to kick off the Easter holiday, and fun way to warm up for the Saturday egg hunt. Hopefully you all are having a fun Easter holiday as well. Swedish kids brand Koolabah is an old favorite of mine. Their style has always been innovative and unique, bringing me fun and minimalistic clothes for my kid. Their cuts and styles are often fun and edgy and a brand with the core values "humor, respect and attitude" will always score high in my book. And this year's spring/summer line-up is probably my favorite collection from Koolabah so far. How can you not love balloon animals in monochrome? Or popcorn pattern knee socks? It makes me wish that I was four years old as well. There are so many great pieces from this brand that I want to show you - and I will, I promise - I just couldn't resist bringing you a few photos from this afternoon. We finally got some spring sun so we pulled out the kickbike and the new knee and elbow pads from Triple 8 and went to the park. Let me tell you; the kid was ecstatic. The skateboard protection pads, the Vans cap and the sneakers all come from Brädkultur, our go-to shop for anything skate-related. Now lets just hope that spring is here to stay. We need more days like today. Contributing at Free and Wild Child! Great news! As of today I am the newest contributor to the Free and Wild Child blog! I am so excited about this collaboration because this blog has been in my favorites list for ever and ever. Karianne and the other bloggers over there do amazing things and their resources on ethically made kids-fashion are endless. Me and the kid feel like we'll be in very good company and we can't wait to get to work on more editorials for www.freeandwildchild.com. Alabama Blue Worn jeans, Norton bomber jacket and Seb print sweater, all from I Dig Denim. The first drop from I Dig Denim finally hit the retailers shelves a few days ago and what a beautiful drop it is. I am in love with all the shades of blue and, after going through the first part of 2016 SS collection, I am even more excited for spring to arrive. Thankfully we had sunny spring weather in Stockholm today and I managed to snap a couple of photos of the kid wearing his new Norton jacket, Zeke beanie and Alabama jeans. Norton, mid-blue bomber jacket, available in sizes 86 - 170. The Norton jacket is a dream come true. A beautiful shade of blue that breathes summer, even in February. The fabric is tougher than the grey Norton model from last year, perfect for windy spring days and cold summer nights. The details is true craftsmanship as usual and it was true love from the moment I first saw it. I realize that since IDD made their first bomber jacket (the dark blue from AW'14) I've said that every new version is my favorite - but this one is perfect! It really is! Alabama Blue Worn is a model with distressed details for that vintage look. Alabama has mid-waist, relaxed fit with tapered leg and narrow foot. The material is soft and slightly stretchy for maximum comfort. The kid has tried pretty much every model of jeans that I Dig Denim has made and by now we have our favorites. One of them is the Alabama, and this season it comes in a beautiful blue color with natural fading and distressed details which makes them look comfortable and perfectly worn from the get-go. I love them because they have the perfect summer look but the thing that the kid love most about them is the stretchy quality - a feature that allows him to run and climb without limitations. Ability to move freely is crucial when you are four years old and aspire to be a Ninja. Zeke, knitted hat, in black. And then there's our beloved Zeke beanie. A chimney-hat that the kid already owns in grey and that keeps being one of our absolute gems. I was beyond happy when I saw that it would arrive in black and I know that it will be worn a lot this spring. I can't wait to photograph more of the drop. Like the new logo sweaters and the t-shirts and shorts. But until then; make sure to check out the lookbook for ss16 at www.idigdenim.se for the full collection. or look us up at our @my_kid_willem instagram account.